I obtained my drivers my licence at the age of 16. My father then bought me a 150cc Vespa scooter (because motorbikes were dangerous) and, after riding that for a few years, I met some local guys riding motorbikes. After going for a test ride in the summer of 1967 on a Triumph (and almost falling off because it accelerated so fast), I decided the scooter was for kids and bought a real bike, a 1958 650cc Triumph Tiger. At that time, bikers gathered in small groups at various locations around Adelaide and I hung out with the Semaphore guys. Over that summer we would visit other groups and I soon found out that bike central in Adelaide was the Brunchburger cafe behind the Enfield shopping centre. If you wanted to meet other riders, that was the place to go. Conveniently, it was also only a few Kms from my place so I started hanging out with them. There was always someone there on weeknights or weekends and when enough people turned up, we went for a ride. In winter, that was usually to visit a bike club or another group around town, but in summer, it meant a ride through the hills. It might just be a short ride up to the Eagle on the Hill, a longer ride through the hills or a run to Murray Bridge (this was before the Freeway opened). It didn’t mater where you were going, once you got to the Devils Elbow, it was always full on. That’s where most Adelaide bikers learned to ride and many racing careers were born in those hills. When Enfield closed in 1969, another group started Woodville. They used to meet on Wednesday nights at a Service Station and go for a run to a pub in the hills. 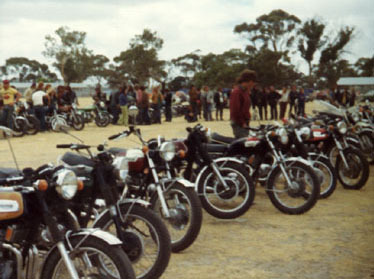 Some of us from Enfield started going there and in 1970 that group was regularly getting 10 bikes or more on those runs. It was always a good ride to the pub and after a few drinks, a race back to the city limits. There were no radar guns or breathalysers in those days so we got away with a lot, sometimes I wonder how I survived. Many of the guys on those runs started joining Phoenix and soon became the core of that Club. Some of the regular road trips during those early years were to the Easter Speedway and Scramble at Port Pirie and the October road races at Mt Gambier. A sleeping bag, bottle of Port and off with the group for the weekend camping on the side of the road. There was also the long track speedway at Morgan run by the Velocette club, the annual 24 Hour Trial and the Rallies. The first rally I went to was Ballarat in 1967 and in 1968 went to the Southern Cross at Mt Barker and every one after that. There is nothing like going for a ride in a group of 50 or so bikes, I can see why the outlaw clubs like their runs. 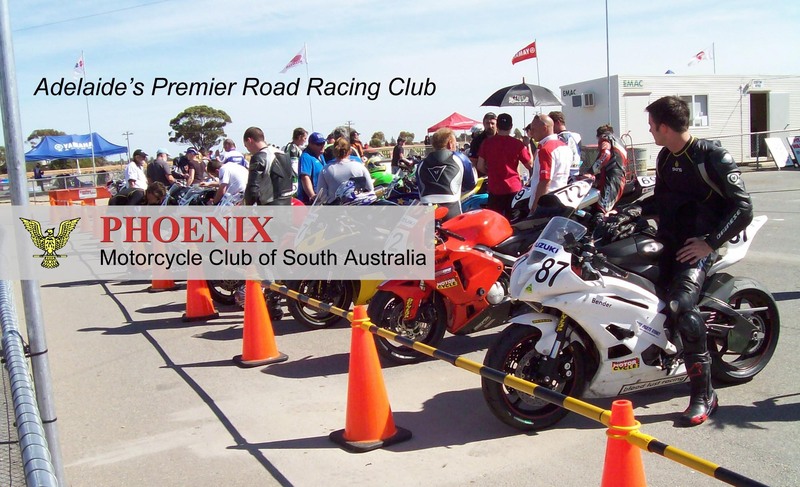 In the early 70’s a group of riders, mainly Phoenix members, had started meeting on Sundays at the Eagle on Hill garage and going for a run to Lobethal. I think Russel Hanby was the main instigator of this run which over the next 20 years became an Adelaide institution and brought many members into the Club. Although a social activity and regularly discussed at meetings, we refused to publicly sanction it due to its illegal nature. However, we did donate a good first aid kit to the Lobethal Milk Bar where everyone met at the end of the ride. A custom started back then was marking your corner. If you fell off, you would go back the next week with a can of white paint and write your name on the corner, and there were a lot of names written on that road. The Sunday run became such a circus that spectators would set up their deck chairs at vantage points and wait for the bikes to go through. Eventually, that attracted the attention of the police and the organised ride broke up. Riders started going their own way to places like Cuddly Creek which now attracts the police attention due to the number of serious accidents. They have also reduced the speed limit on the hills roads to 80KPH so all the fun (and most of the risk) has gone. My main problem was riding an old Triumph. 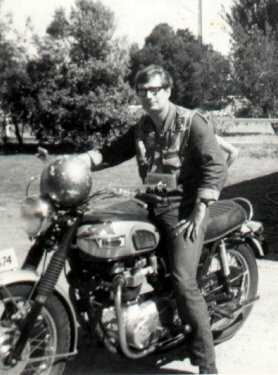 It didn’t always make it back from a weekend trip away, so in Xmas 1969 I bought a new Triumph Bonneville T120. They had just released the 750cc Honda four and the BSA triple, but they were unproven and more expensive so I stuck with the Bonnie. While that solved the reliability problems for a while, eventually it started to let me down. I discovered from other riders what the main attraction of the multi cylinder Jap bikes was – they were smooth, reliable and didn’t leak oil. By that time I also had a car and was not riding as much, so my next and last bike in 1976 was a 175cc Yamaha trail. I sold that along with my dilapidated Triumph in 1978 when I bought a house and a mortgage. Sometimes I get nostalgic and think about restoring an old Triumph and going for rides. Then I remember why they stopped making them, how much I used to fall off and what a knee reconstruction feels like. I’ll settle for the memories. p.s. You have to scratch that itch, so at the age of 59 I bought a 650 Hyosung and started riding again. Electric start, no oil leaks and nothing fell off, what a change from the old Triumph. It was a nice bike with enough power to satisfy my craving for a run through the hills on Sunday, but eventually the novelty wore off and I sold it after 5 years.